You will rage, but its all your fault! Don't take it out on the game! [dropcap]S[/dropcap]uper Hexagon has you control a little triangle that can only circle around the middle shape of the screen, as on-coming lines and shapes try to box you in, your goal… to quickly find the opening and escape being boxed in. Sounds so easy, yet, I’d like to see anyone play this game for their first time and get over 10 seconds, it’s nearly impossible! Sure after a few tries you’ll learn some of the patterns that go against you, but I’ve been playing this for a little over a week and I still haven’t even topped 40 seconds! I love this game… despite raging hard and getting seizures due to the flashing colors. 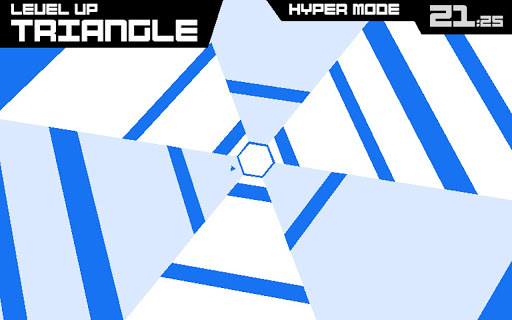 The combination of music and on-screen action where the shapes are coming down and the colors change up is what makes this game a memorable one. It is extremely difficult, I mean… the modes are Hard, Harder, Hardest. The farthest I’ve gotten on Hard is just 39.12 seconds! Harder I reached 16.28 seconds, and 5.07 seconds on Hardest. The thing that I can’t believe is that there are 3 other levels after those, unlocked after you ‘complete’ each of the difficulties. After 10 seconds on each one, you essentially level up and the map takes a new form and sends out new shapes to throw you off, I haven’t gotten to the end but I can only imagine that it takes place after a minute on each. My favorite feature of this game is one of most obvious things that I’m glad Terry Cavanagh added, a quick restart. Once your in the zone, and get far, and suddenly fail, all you want to do is start over and get back to beating that high score. So after each death, simply tap anywhere on the screen to have at it again. Of course you should get this game! Often I mention how much I love mobile games that are simple and quick, well, this one is the quickest you will ever face! Depending on fast your hand-eye coordination is, you’ll either be a master at this game, or a complete failure. 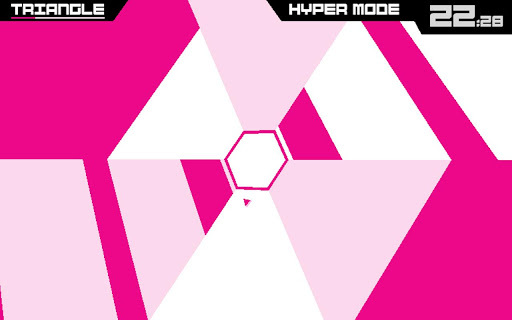 Interested in getting Super Hexagon?